या शब्दाच्या इतर उपयोगांसाठी पाहा, स्नेहभाव (निःसंदिग्धीकरण). 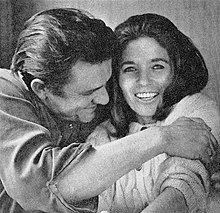 Affection shown between a couple. Affection is a "disposition or state of mind or body" that is often associated with a feeling or type of love. It has given rise to a number of branches of philosophy and psychology concerning: emotion (popularly: love, devotion etc); disease; influence; state of being (philosophy); and state of mind (psychology). A kiss can express affection. "Affection" is popularly used to denote a feeling or type of love, amounting to more than goodwill or friendship. Writers on ethics generally use the word to refer to distinct states of feeling, both lasting and spasmodic. Some contrast it with passion as being free from the distinctively sensual element. More specifically the word has been restricted to emotional states, the object of which is a person. In the former sense, it is the Greek "pathos" and as such it appears in the writings of French philosopher René Descartes, Dutch philosopher Baruch Spinoza, and most of the writings of early British ethicists. However, on various grounds (e.g., that it does not involve anxiety or excitement and that it is comparatively inert and compatible with the entire absence of the sensuous element), it is generally and usefully distinguished from passion. In this narrower sense the word has played a great part in ethical systems, which have spoken of the social or parental affections as in some sense a part of moral obligation. For a consideration of these and similar problems, which depend ultimately on the degree in which the affections are regarded as voluntary, see H. Sidgwick, Methods of Ethics pp. 345–349. Numerous behaviors are used by people to express affection. 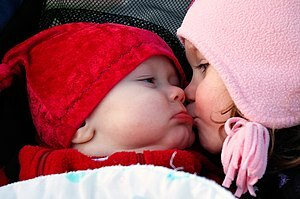 Some theories suggest that affectionate behavior evolved from parental nurturing behavior due to its associations with hormonal rewards with research verifying that expressions of affection, although commonly evaluated positively, can be considered negative if they pose implied threats to one's well being. Furthermore, affectionate behavior in positively valenced relationships may be associated with numerous health benefits. Other, more loving type gestures of affectionate behavior include obvious signs of liking a person. साचा:Unreferenced section In psychology the terms affection and affective are of great importance. As all intellectual phenomena have by experimentalists been reduced to sensation, so all emotion has been and is regarded as reducible to simple mental affection, the element of which all emotional manifestations are ultimately composed. The nature of this element is a problem that has been provisionally, but not conclusively, solved by many psychologists; the method is necessarily experimental, and all experiments on feeling are peculiarly difficult. The solutions proposed are two. In the first, all affection phenomena are primarily divisible into those that are pleasurable and those that are the reverse. The main objections to this are that it does not explain the infinite variety of phenomena, and that it disregards the distinction that most philosophers admit between higher and lower pleasures. The second solution is that every sensation has its specific affective quality, though by reason of the poverty of language many of these have no name. W. Wundt, Outlines of Psychology (trans. C. H. Judd, Leipzig, 1897), maintains that we may group under three main affective directions, each with its negative, all the infinite varieties in question; these are (a) pleasure, or rather pleasantness, and displeasure, (b) tension and relaxation, (c) excitement and depression. These two views are antithetic and no solution has been discovered. Affiliation: Spending time with other people. Nurturance: Taking care of another person. Play: Having fun with others. The first, introduced by A. Mosso, the Italian psychologist, consists in recording the physical phenomena that accompany modifications of the affective consciousness. Thus it is found that the action of the heart is accelerated by pleasant, and retarded by unpleasant, stimuli; again, changes of weight and volume are found to accompany modifications of affection—and so on. Apart altogether from the facts that this investigation is still in its infancy and that the conditions of experiment are insufficiently understood, its ultimate success is rendered highly problematical by the essential fact that real scientific results can be achieved only by data recorded in connection with a perfectly normal subject; a conscious or interested subject introduces variable factors that are probably incalculable. The second is Fechner's method; it consists of recording the changes in feeling-tone produced in a subject by bringing him in contact with a series of conditions, objects or stimuli graduated according to a scientific plan and presented singly in pairs or in groups. The result is a comparative table of likes and dislikes. Mention should also be made of a third method that has hardly yet been tried, namely, that of endeavouring to isolate one of the three directions by the method of suggestion or even hypnotic trance observations. E. B. Titchener, Experimental Psychology (1905); art. "Psychology" and works there quoted. या पानातील शेवटचा बदल ३ सप्टेंबर २०१८ रोजी ०८:२९ वाजता केला गेला.